Bring the water and butter to a boil in a large saucepan over medium heat. Add the flour and mix vigorously with a wooden spoon for about 5 minutes. The mixture should be very dry and come away from the sides of the pan. Remove the saucepan from the heat and set it aside to cool for 5 minutes. Then begin to add the eggs, one at a time, beating well after each. Continue to beat until the dough is very smooth. Heat the oil in a deep fryer or wide, deep saucepan to 350 to 375 degrees F.
Drop batter by heaping tablespoons into the oil, a few at a time, without crowding. The zeppole should cook for about 5 minutes getting very brown and crisp. Drain them on paper towels and let them cool a few minutes. Sift confectioners sugar over the top. You can fill zeppole after they are fried and cooled. Put the filling in a pastry bag with a plain tube with a 1/2-inch opening. Push the tip into the side of each zeppole and squeeze some of the filling inside. Alternately, you can cut the zeppole almost in half and spoon some of the filling into the center. Combine all the ingredients with an electric mixer. Refrigerate for 30 minutes before filling zeppole. Mix cinnamon and sugar in a bowl. Set aside. Combine water, butter, and salt in a saucepan. Stir over medium heat until butter melts. Bring to a boil Add flour and stir to blend. Cook over medium heat, stirring constantly, until dough forms a ball, about 1 minute. Remove from heat. Add eggs, one at a time, blending well after each addition. When complete, dough should be glossy and smooth. Heat oil in a deep saucepan or deep fryer. Carefully drop mounded tablespoons of dough into the oil. Cook until golden brown, about 3-5 minutes. Only fry a few at a time or as many as your pan will hold without crowding. Use a slotted spoon to remove the zeppole from the oil and place on paper towels to drain. Immediately roll zeppole in cinnamon-sugar mixture. Serve warm. 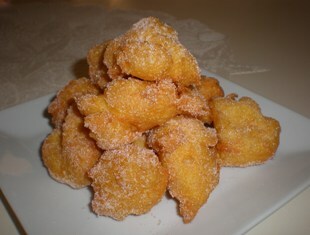 Note: Frying the dough for 3-4 minutes will give you a tender zeppole. Frying for 5 minutes will give you a crisper zeppole. Zeppole are a fried Italian pastry that are served warm and dusted with confectioners' sugar or cinnamon-sugar. 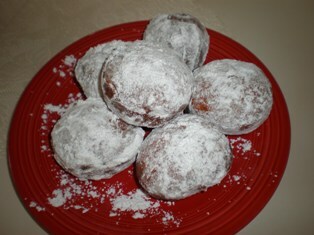 They can also be filled with a sweetend ricotta cheese. 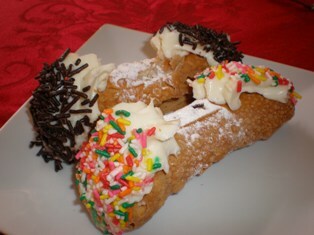 Zeppole are a traditional treat made for St. Joseph's Day which is March 19. 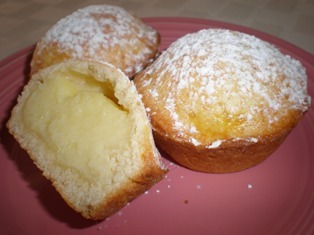 Fried pastries are also a typical sweet made for Carnevale, which is similar to Mardi Gras in the US, and is the final celebration before Ash Wednesday and the season of Lent. Deep-frying is submerging food in oil or fat and cooking it quickyly at a high temperature. The science behind deep-frying is quite simple: when the oil is hot enough, the surface of the food will cook instantly, forming a seal that the fat can't penetrate. At the same time, the moisture inside the food is converted to steam, which cooks the food from the surface inwards. If the oil temperature isn't high enough, the food will emerge greasy and may stick together. If it's too hot, the exterior of the food will cook too quickly and burn before the inside is cooked. For this reason, a deep-frying or confectionery thermometer is useful, as it helps you maintain a constant temperature. Alternatively, you can use an electric deep-fryer with an in-built thermostat, which makes it easier to set and maintain the temperature. Once the oil has reached the desired temperature, use a metal slotted spoon to carefully lower in your ingredients. Avoid overcrowding the pan - while you need enough oil to cover the food, it's important to leave room for it to rise. Ingredients should also be at room temperature - food that has been chilled will reduce the oil temperature. When turning food in the oil, use something rounded (such as a spoon or tongs), as pointed utensils (such as a fork) can pierce the surface and cause moisture to escape. After deep-frying, drain food, then serve immediately - deep-fried food is best eaten piping hot!